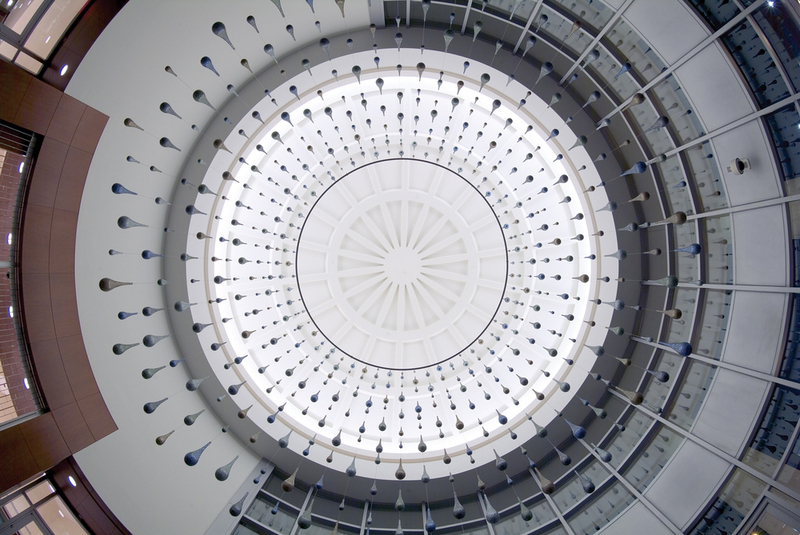 Ring of Water "floats" in the rotunda of the Courthouse Building, visible from the exterior of the building through windowpanes framed by large columns. 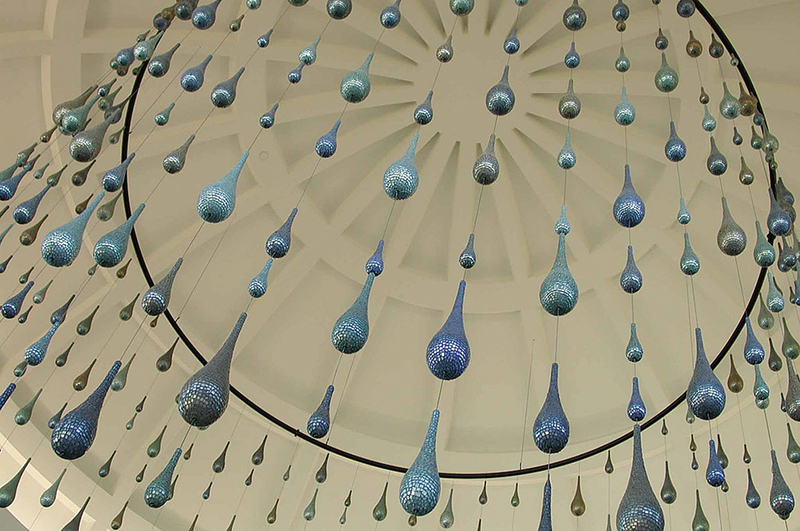 The work surrounds visitors once they step through the main entrance, creating a contrast between the delicate "drops of water" and the massive columns. Fifty six cables, each strung with 10 pods of "water" hang from an 18' ring. Each pod is covered with hand cut and hand-placed blue/gray glass. Ring of Water also includes a terrazzo floor component. 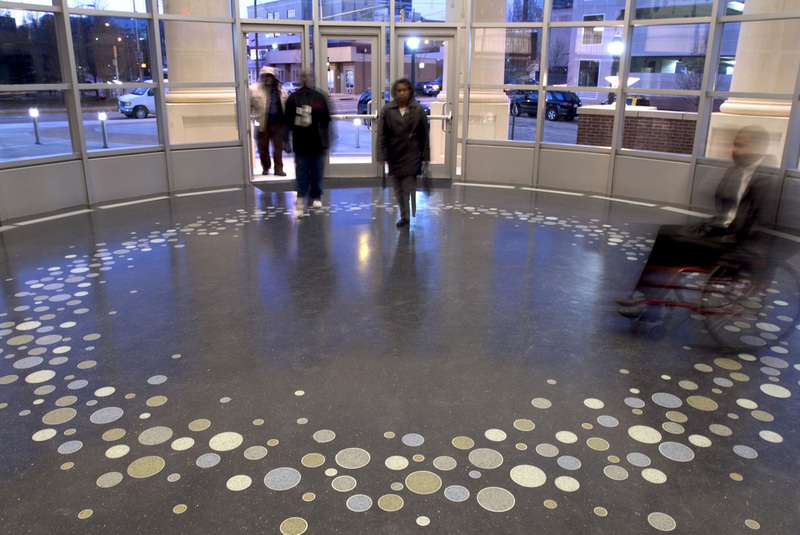 The terrazzo circles correspond to the drops of water as if the hanging drops continued to fall, which again addresses the feeling in the whole space. Ring of Water speaks about how the presence of water suggests a cooling down of the heat - both the literal summer heat in Atlanta and the figurative emotional heat that fills a courtroom. The city of Atlanta awarded Ring of Water an Urban Design award and it was also featured in Sculpture Magazine. Americans for the Arts recognized it as one of the top public art pieces of 2003.